As reported in IPCC (1998), stress on water availability in Asia is likely to be exacerbated by climate change. Several studies aimed at understanding the nature and magnitude of gains/losses in the yield of particular crops at selected sites in Asia under elevated CO2 conditions have been reported in the literature (e.g., Luo and Lin, 1999). These studies suggest that, in general, areas in mid- and high-latitudes will experience increases in crop yield, whereas yields in areas in the lower latitudes will decrease. Generally, climatic variability and change will seriously endanger sustained agricultural production in tropical Asia in coming decades. The scheduling of the cropping season as well as the duration of the growing period of the crop would also be affected. Agricultural productivity in tropical Asia is sensitive not only to temperature increases, but also to changes in the nature and characteristics of monsoon. An increase in leaf-surface temperature would have significant effects on crop metabolism and yields, and it may make crops more sensitive to moisture stress (Riha et al., 1996). Experiments in India reported by Sinha (1994) found that higher temperatures and reduced radiation associated with increased cloudiness caused spikelet sterility and reduced yields to such an extent that any increase in dry-matter production as a result of CO2 fertilization proved to be no advantage in grain productivity. Similar studies conducted recently in Indonesia and the Philippines confirmed these results. Amien et al. (1996) found that rice yields in east Java could decline by 1% annually as a result of increases in temperature. In tropical Asia, though wheat crops are likely to be sensitive to an increase in maximum temperature, rice crop would be vulnerable to an increase in minimum temperature. The adverse impacts of likely water shortage on wheat productivity in India could be minimized to a certain extent under elevated CO2 levels; these impacts, however, would be largely maintained for rice crops, resulting in a net decline in rice yields (Lal et al., 1998). Acute water shortage conditions combined with thermal stress should adversely affect wheat and, more severely, rice productivity in India even under the positive effects of elevated CO2 in the future. Simulations of the impact of climate change on wheat yields for several locations in India using a dynamic crop growth model, WTGROWS, indicated that productivity depended on the magnitude of temperature change. In North India, a 1 °C rise in the mean temperature had no significant effect on potential yields, though an increase of 2 °C reduced potential grain yields at most places (Aggarwal and Sinha, 1993). In a subsequent study, Rao and Sinha (1994) used the CERES-Wheat simulation models and scenarios from three equilibrium GCMs and the transient GISS model to assess the physiological effects of increased CO2 levels. In all simulations, wheat yields were smaller than those in the current climate, even with the beneficial effects of CO2 on crop yield; and yield reductions were due to a shortening of the wheat-growing season, resulting from temperature increase scenario. Wheat yield decreases could have serious impacts on food security in India, in view of the increasing population and its demand for grains. Most of the wheat production in India comes from the northern plains mostly belonging to semi-arid zone. In this tract, it is almost impossible to increase the present area of wheat under irrigation. Karim et al. (1996) also have shown that wheat yields are vulnerable to climate change in Bangladesh. Studies on the productivity of sorghum showed adverse effects in rainfed areas of India (Rao et al., 1995). Results were similar for corn yields in the Philippines (Buan et al., 1996). The likely impact of climate change on the tea industry of Sri Lanka was studied by Wijeratne (1996). He found that tea yield is sensitive to temperature, drought, and heavy rainfall. An increase in the frequency of the droughts and extreme rainfall events could result in a decline in tea yield, which would be greatest in the low-country regions (<600 m). In Asia, where rice is one of the main staple foods, production and distribution of rice-growing areas may be affected substantially by climate change. Disparity between rice-producing countries is already visible and it is increasingly evident between developed and developing countries. The projected decline in potential yield and total production of rice in some Asian countries, because of changes in climate and climate variability would have a significant effect on trade in agricultural commodities, hence on economic growth and stability (Matthews et al., 1995). Studies of the potential regional impacts of climate change on the forests and forestry of tropical Asia are limited. Results of research from Thailand suggest that climate change would have a profound effect on the future distribution, productivity, and health of Thailand's forests. Using climate change scenarios generated by the UKMO and GISS GCMs, Boonpragob and Santisirisomboon (1996) estimated that the area of sub-tropical forest could decline from the current 50% to either 20 or 12% of Thailand's total forest cover (depending on the model used), whereas the area of tropical forests could increase from 45 to 80% of total forest cover. Somaratne and Dhanapala (1996) used the same model for Sri Lanka and estimated a decrease in tropical rainforest of 2-11% and an increase in tropical dry forest of 7-8%. A northward shift of tropical wet forests into areas currently occupied by tropical dry forests also is projected. In semi-arid regions of tropical Asia, tropical forests generally are sensitive to changes in temperature and rainfall, as well as changes in their seasonality. Arid and semi-arid lands often carry a sizeable representation of trees and shrubs in the vegetative cover. Changes in climatic condition would affect all productivity indicators of forest (NPP, NEP and NBP) and their ability to supply goods and services. Fires, which are also influenced by these changes, significantly affect the structure, composition, and age diversity of forests in the region. Enhanced level of global warming is likely to make forest fire more frequent in arid and semi-arid regions of Asia. Deforestation along with the potential impacts of climate change, may have a negative impact on sustainable-nutrition security in south Asia (Sinha and Swaminathan, 1991). The effect of climate change on soil erosion and sedimentation in mountain regions of tropical Asia may be indirect but could be significant. An erosion rate in the range of 1-43 tons ha-1 with an average of 18 tons ha-1 was calculated in three small experimental plots in central Nepal. Part of generated sediment may be deposited on agricultural lands or in irrigation canals and streams, which will contribute to deterioration in crop production and in the quality of agricultural lands. The impact of climate change on coastal areas in tropical Asia could be severe and in some areas catastrophic. The combined effects of subsidence and sea level rise could cause serious drainage and sedimentation problems in addition to coastal erosion and land loss in deltaic areas of tropical Asia. Climate change is likely to cause environmental and social stress in many of Asia's rangelands and drylands. Precipitation is scarce and has a high annual variance in dryland areas of tropics. Very high daily temperature variance is recorded with frequent sand storm, dust ghost and intense sunshine. Nutrient contents of the soils are low. Being exposed to degradation as a result of poor land management, soils could become infertile as a result of climate change. Temperature increases would have negative impacts on natural vegetation in desert zones. Plants with surface root systems, which utilize mostly precipitation moisture will be vulnerable. Climate change also would have negative impacts on sheep breeding and lamb wool productivity. Because soil moisture is likely to decline in this region, the least dryland type (dry sub-humid drylands) is expected to become semi-arid and semi-arid land is expected to become arid. The survival rate of pathogens in winter or summer could vary with an increase in surface temperature (Patterson et al., 1999). Higher temperatures in winter will not only result in higher pathogen survival rates but also lead to extension of cropping area, which could provide more host plants for pathogens. Thus, the overall impact of climate change is likely to be an enlargement of the source, population, and size of pathogenic bacteria. Damage from diseases may be more serious because heat-stress conditions will weaken the disease-resistance of host plants and provide pathogenic bacteria with more favorable growth conditions. The growth, reproduction, and spread of disease bacteria also depend on air humidity; some diseases-such as wheat scab, rice blast, and sheath and culm blight of rice will be more widespread in tropical regions of Asia if the climate becomes warmer and wetter. Surface water and ground water resources in the arid and semi-arid Asian countries play vital roles in forestry, agriculture, fisheries, livestock production and industrial activity. The water and agriculture sectors are likely to be most sensitive and hence vulnerable to climate change-induced impacts in the arid and semi-arid tropical Asia. Croplands in many of the countries in the region are irrigated because rainfall is low and highly variable (IPCC 2001b). The agriculture sector here is potentially highly vulnerable to climate change because of degradation of the limited arable land. Almost two-thirds of domestic livestock are supported on rangelands, though in some countries a significant share of animal fodder also comes from crop residue. The combination of elevated temperature and decreased precipitation in arid and semi-arid rangelands could cause a manifold increase in potential evapotranspiration, leading to severe water-stress conditions. Many desert organisms are near their limits of temperature tolerance. Because of the current marginal-ity of soil-water and nutrient reserves, some ecosystems in semi-arid regions may be among the first to show the effects of climate change. Climate change has the potential to exacerbate the loss of biodiversity in this region. Agriculture constitutes a large share of African economies, with a mixture of subsistence and commercial production. Forestry is an important complement to agriculture in many rural areas, but managed forests are less significant. Several reports (IPCC 2001b; Parry et al., 1988) refer to countries in the arid and semi-arid regions, especially in West Africa, as being vulnerable to projected climate change. Recently, IPCC (2001b) reinforced the concern that climate change resulting in increased frequencies of drought poses the greatest risk to agriculture. Consequently, the arid and semi-arid tropics, which are already having difficulty coping with environmental stress, are likely to be most vulnerable to climate change. Agriculture in the semi-arid tropics of Africa, which is predominantly rainfed, is finely tuned to climate as it relies on the timely onset of rainfall and its regular distribution through the rainy season. Hence even a slow, small change towards a worsening climate can increase climatic risks. Waggoner (1992) concluded that if the present climate is a productive one, warmer and drier will hurt. In the semi-arid tropics of Africa, however, the present climate itself is marginally productive and this introduces a greater risk if climate worsens further. 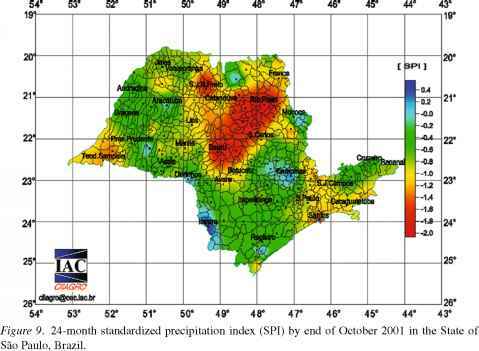 Impacts of climate variability and change in the arid and semi-arid tropics of Africa can be described as those related to projected temperature increases, the possible consequences to water balance of the combination of enhanced temperatures and changes in precipitation and sensitivity of different crops/cropping systems to projected changes. The general conclusion is that climate change will affect some parts of Africa negatively, though it will enhance prospects for crop production in other areas (see Downing, 1992, for case studies of agriculture in Kenya, Zimbabwe, and Senegal). Warmer climates will alter the distribution of agroecological zones. Highlands may become more suitable for annual cropping as a result of increased temperatures (and radiation) and reduced frost hazards. Although C3 crops exhibit a positive response to increased CO2 (as much as 30% with 2xCO2), the optimal productive temperature range is quite narrow. Some regions could experience temperature stress at certain growing periods - necessitating shifting of planting dates to minimize this risk. Expansion of agriculture is important in the east African highlands. For example, agroecological suitability in the highlands of Kenya would increase by perhaps 20% with warming of 2.5 °C based on an index of potential food production (Downing, 1992). In contrast, semi-arid areas are likely to be worse off. In eastern Kenya, 2.5 °C of warming results in a 20% decrease in calorie production. In some lowlands, high-temperature events may affect some crops. Growth is hindered by high temperatures, and plant metabolism for many cereal crops begins to break down above 40 °C. Burke et al. (1988) found that many crops manage heat stress (with ample water supply) through increased transpiration to maintain foliage temperatures at their optimal range. Because a large portion of African agriculture is rain-fed, however, heat-related plant stress may reduce yields in several key crops - such as wheat, rice, maize, and potatoes. At the other extreme of the C3 temperature spectrum, several crops (such as wheat and several fruit trees) require chilling periods (vernalization). Warmer night temperatures could impede vernalization in plants that require chilling such as apples, peaches, and nectarines. Locations suitable for grapes and citrus fruit would shift to higher elevations. C4 crops are more tolerant, in general, to climate variations involving temperature ranges between 25 and 35 °C. These crops most often are located in warmer, dryer climates; they are quite susceptible to water stress. According to IPCC (2001a), the globally averaged surface temperature is projected to increase by 1.4 to 5.8 °C over the period 1990 to 2100. The number of days with temperature above a given value at the higher end of distribution will increase substantially and there will be a decrease in the days with temperature at the lower end of the distribution (IPCC, 2001a). In certain agroecological zones such as Southern Sahelian zone of West Africa, where the predominant soils are sandy in nature, increased mean temperature could affect the maximum temperatures at the soil surface substantially. It is conceivable that surface soil temperatures could exceed even 60 °C. 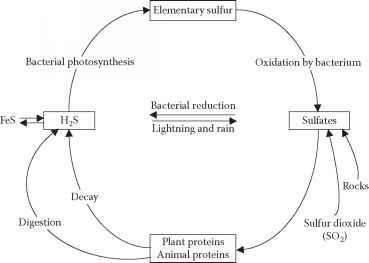 Under higher temperatures, enzyme degradation will limit photosynthesis and growth. Increased temperatures will result in increased rates of potential evapotranspiration. In the long term, the very establishment and survival of species in both the managed and unmanaged ecosystems in this region may be threatened resulting in a change in the community structure. Most livestock in Africa are herded in nomadic areas, though significant numbers are kept in paddocks on farms. Domestic animals, especially cattle, also will be affected by climate change. In the cold highlands of Lesotho, for example, animals would benefit from warmer winters, but could be negatively affected by a lowering of the already low nutritional quality of grazing. There is wide consensus that climate change, through increased extremes, will worsen food security in Africa. Evidence shows that certain arid, semi-arid and dry sub-humid areas have experienced declines in rainfall, resulting in decreases in soil fertility and agricultural, livestock, forest and rangeland production. Projected temperature increases are likely to lead to increased open water and soil/plant evaporation. As a rough estimate, potential evapotranspiration over Africa is projected to increase by 5-10% by 2050. Since Africa is the continent with the lowest conversion factor of precipitation to runoff (averaging 15%), the dominant impact of global warming is predicted to be a reduction in soil moisture in subhumid zones and a reduction in runoff. The prospect of global climate change has serious implications for water resources and regional development (Riebsame et al., 1995). Numerous cases of the devastating affects of interannual variability of rainfall on crop yields and national economies have been seen in the past five decades, but none more dramatic than the Sahelian droughts in the early 70s. Average yields of groundnut in Niger decreased from 850 kg/ha in 1966-1967 to 440 kg/ha by 1981 due mainly to drought and diseases (Toukoua, 1986). Ojima et al. (1996) used the CENTURY (Parton et al., 1992) ecosystem process model of plant-soil interactions to analyze the impact of climate and atmospheric CO2 changes on grasslands of the world, including seven of 31 sites in Africa. Ojima et al. (1996) looked at the effects of increasing CO2 and climate, using climate change scenarios based on the Canadian Climate Centre (CCC) and GFDL GCMs. They found that changes in total plant productivity were positively correlated to changes in precipitation and nitrogen mineralization (with nitrogen mineralization the most important factor). The response to nitrogen mineralization was consistent with the general observation that grasslands respond positively to addition of nitrogen fertilizer (Rains et al., 1975; Lauenroth and Dodd, 1978). Plant responses to CO2 were modified in complex ways by moisture and nutrient availabilities; their results generally indicated that CO2 enrichment had a greater effect with higher moisture stress. However, nutrient limitations reduced CO2 responses. Ojima et al. (1996) concluded that increased atmospheric CO2 will offset the negative effects of periodic droughts, making grasslands more resilient to natural (and human-induced changes in) climate variability. The strength of this beneficial effect, however, is controlled by the availability of nitrogen and other nutrients, which tend to be limited in many African landscapes. In Africa, most mid-elevation ranges, plateaus, and high-mountain slopes are under considerable pressure from commercial and subsistence farming activities (Rogers, 1993). Mountain environments are potentially vulnerable to the impacts of global warming. This vulnerability has important ramifications for a wide variety of human uses - such as nature conservation, mountain streams, water management, agriculture, and tourism (IPCC 1996, WGII, Section 5.2). Using the ACRU/CERES hybrid model - one of the most sophisticated crop-climate models developed in Africa - Schulze et al. (1996) have evaluated the impact of climate change on maize in South Africa. The investigators divided the diverse geography of South Africa into 712 relatively homogeneous zones, each associated with vegetation, soil, and climate data. Daily values of temperature (minimum and maximum), rainfall, wind speed, and solar radiation are used in the crop evaluation, based on the CERES-Maize model. Recent scenario analysis of the model (see Hulme, 1996a) shows a wide range of potential maize yields in South Africa. For three scenarios of climate change (corresponding to the middle of the next century), yields decrease in the semi-arid west. For most of the country, however, potential yields would increase, generally by as much as 5 t/ha. The CO2 enrichment effect counteracts the relatively modest changes in temperature and precipitation. In parts of the eastern highlands, particularly in Lesotho, dramatic increases in yields result from higher temperatures. Hulme (1996b) presents an integrated view of climate impacts in southern Africa. Prospects for agriculture depend critically upon changes in precipitation. A "dry" scenario suggests less-suitable conditions in semi-arid and subhumid regions. With little decrease (or increases) in precipitation, agriculture should be able to cope with the average changes. However, shifts in drought risk need to be considered. The extent of effects of higher temperatures on African vegetation (e.g., effects on respiration rates, membrane damage) is largely uncertain. Temperature is known to interact with CO2 concentration, so expected increases in respiration resulting from a temperature increase alone may be offset or even reduced by higher CO2 concentrations (Wullschleger and Norby, 1992). The direct impacts of changes in the frequency, quantity, and intensity of precipitation and water availability on domestic animals are uncertain. However, increased droughts could seriously impact the availability of food and water - as in southern Africa during the droughts of the 1980s and 1990s (IPCC, 2001b). Agricultural pests, diseases, and weeds also will be affected by climate change. Little quantitative research on these topics has been undertaken in Africa, however. Perhaps the most significant shifts could occur in tsetse fly distributions and human disease vectors (such as mosquito-borne malaria). Tsetse fly infestation often limits where livestock can be kept or the expansion of extensive agriculture (Hulme, 1996a). Declining human health would affect labor productivity in agriculture. The climatic variations observed in Latin America, both in large scale and regional aspects, carry incisive socio-economic impacts on the populations involved. Agriculture and water resources are most affected through the impact of extreme temperatures (excessive heat, frost) and the changes in rainfall (drought, flooding). However, the variations that have a long-lasting effect and that bring the most damage to society are the dry periods and droughts. As a matter of fact, there is evidence that many of the pre-Colombian civilizations had a severe decline in their culture caused by excessive drought or flooding; abnormalities associated with the El Niño phenomenon. The large variations in rainfall, which cause either drought or flooding in these areas, are associated with the El Niño and La Niña phenomena. In many cases, however, there is a joint effect between these and the variations in the temperature of the surface of the North Atlantic Ocean (Alves and Repelli, 1992). Peru is a typical example of a country, where El-Nino impacts and its distinct phases (cold and warm) affect the whole country, with damaging effects on agriculture. The effects observed during the 97/98 episode were droughts, frosts and flooding in different regions of the country, causing losses in over two million hectares of crop land with a reduction in crop yields of up to 50% (Cotrina, 2000). Figure 7. 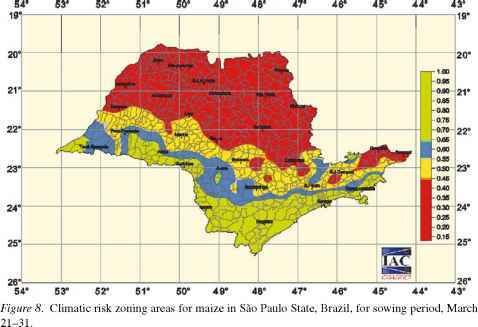 Climatic risk zoning for cotton crop in Brazil (Assad, 2001). support to financing programs and agricultural crop insurance allowing the farmer a minimum economic profitability. The different existing ecosystems in Latin America are subject to a wide variety of impacts, making it impossible to establish a general rule. Nevertheless, in many cases the actions of human beings contribute substantially to the fragility of these ecosystems eg., deforestation in the Amazon region, fires in the central western regions in Brazil, inadequate irrigation management and pollution in southeast Brazil, such as the Sao Paulo city metropolitan area, etc. Other examples could be cited in other countries, however, naming every single one would be too excessive in detail. What evidence suggest that climate in arid and semi arid tropical regions is changing?